Coal is still one of the most used energy sources worldwide, especially in the developing nations. If you are looking for related marketing database to explore business opportunities in the Coal Mining and allied services sector, Blue Mail Media’s Coal Mining Industry Mailing List can be your greatest information resource. The list intends to help you run your multi-channel marketing campaigns flawlessly and achieve increased interactions, conversions and ROI. 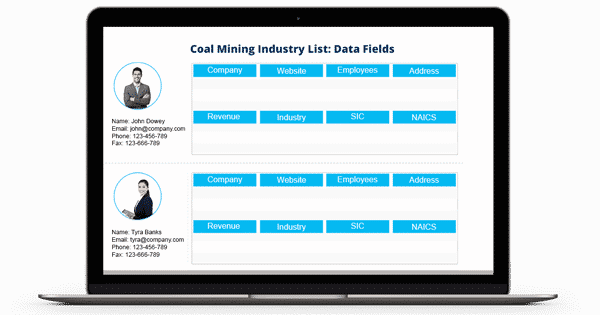 Blue Mail Media’s Coal Mining Industry Email Database has been designed by our experts and data scientists who put immense efforts in collecting data from reliable sources, verifying data for accuracy and updating the same at regular intervals. Also, we offer to customize our database to align with your unique marketing needs so that you achieve the maximum impetus from your marketing campaigns. You can also avail our pre-packaged Coal Mining Executives Database for your immediate marketing requirements. Blue Mail Media has a well established presence across the US, UK, Canada, North America, Africa, Australia, China, India and many other countries. This enables us to serve clients without any regional constrains and help them meet their global goals.